This was suppose to be my third grandchild's turn but I forgot and it is 3:13 am. 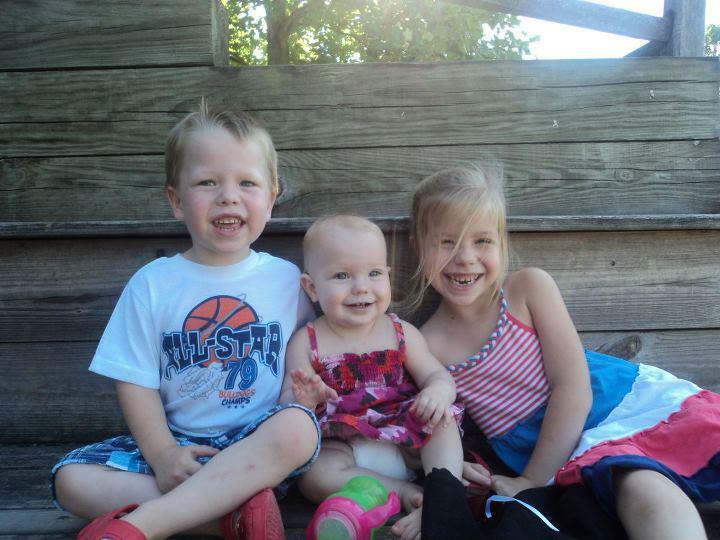 This is, however my one all time favorite picture of my grandchildren! Not because it is the absolute best, or even that is was taken recently because it is over a year old. Memories from the day are so vivid when I look at this photo. We all had such a great time, My daughter, son in law, my three grand children and I. We were at the Autobon Society for 'Monarch Day.' It was a beautiful sunny afternoon in August, 2011. The birds were chirping like they were happy even. I had just been told my surgery wasn't possible due to my health so I was facing a lose/lose or get up and move situation. I had to get proactive. My family may not need me but I want to be here for them. I had given up though, but that day all was right with the world. God was to be seen everywhere that wonderful day! Here it a year later and I have finally decided to do what must be done to have my surgery. I am considering rather it is a fit for my few readers to take them on this adventure with me. Will I be strong enough to do it, will I give up. I don't know the true answers to these questions. Within this picture though it's a beautiful day and all is right with the the world!